Bob Chapman, who runs Manhattan Beach, Calif.-based Chapman Capital, was on Bloomberg TV moments ago. 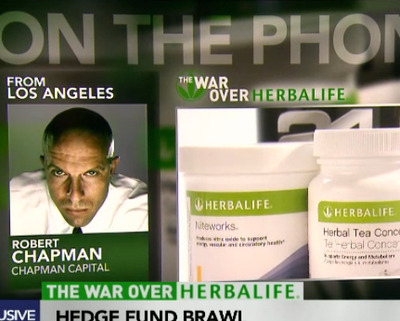 In a telephone interview with Bloomberg TV, Chapman said he completely exited his Herbalife position this morning following the disclosure of Carl Icahn’s massive HLF stake equal to 12.98%, or 14,015,151 shares. He’s on the sidelines for now. He told Bloomberg TV he thinks Ackman will on some level succeed with getting a regulator to look at the company making it seem like he will win, but he thinks Ackman will ultimately fail. Chapman, who is an activist investor known for sending vitriolic letters to company boards, also said he thinks Ackman is “disingenuous” and his massive short case presentation was like “smoke and mirrors” with the facts.